When eating Paleo, we’re often told: “eat your green, leafy vegetables”; and we think of the ever-popular kale and spinach greens. However, Swiss chard includes an impressive array of minerals: potassium, magnesium, calcium, copper, and manganese. It’s also rich in Vitamin A (in the beta-carotene form) and iron (non-heme form). 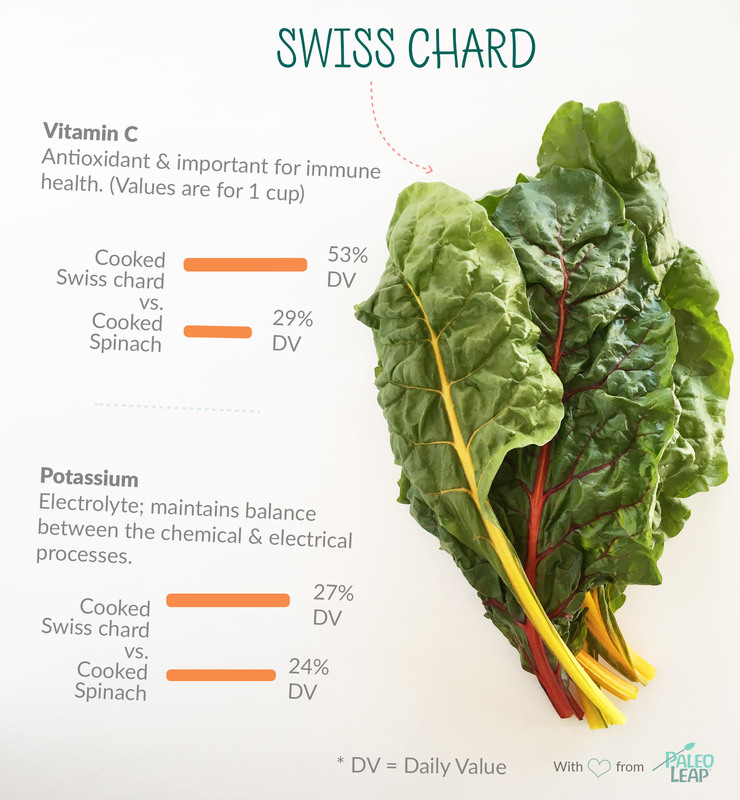 While this form of Vitamin A and iron are not necessarily ideal for absorption, Swiss chard is still a nutrient-dense vegetable. Because the leaves and stalks are quite tough, it’s recommended to chop the stems and leaves, then saute or boil before eating. If you have kidney stones or other kidney issues, you may have heard about restricting oxalates. Green leafy vegetables such as spinach, beet greens and Swiss chard are high in oxalate content. While the actual evidence for restricting oxalates is conflicting, many doctors advise kidney stone patients to avoid oxalates. Orange dots show how 1 cup of cooked Swiss chard fits into the typical nutrient profile of a Paleo meal. ORIGIN: Although the name suggests otherwise, Swiss chard isn’t native to Switzerland — it originates in the Mediterranean region. SELECT: Choose chard that is kept in a chilled display. Look for leaves that are vivid green in color. COLORS: The stalks are a variety of colors including white, red, yellow and orange. Swiss chard is sometimes labeled “rainbow chard” with mixed colors. Boil down Swiss chard and serve under a poached egg breakfast. Saute Swiss chard in olive oil with minced garlic and a squeeze of lemon. Lightly toss and cook Swiss chard until tender. Serve under cod or salmon. Add boiled Swiss chard into an omelet or frittata.